One box that simplifies it all. In so many ways, TV has never been better. The shows are amazing. Live sports and news coverage go beyond anything you might have imagined. The options are almost dizzying. And the way you watch has evolved with apps. Apps give you control over what, when and where you want to watch. But something happened as we marched into this exciting new era. The overall TV experience got left behind. Apple TV simplifies it all. It’s designed for you to easily navigate and, most importantly, fully enjoy this new world of video apps. Apple TV is all you need for the way you watch today. Apps have liberated television, letting you choose precisely what and when you want to watch. Apps like Netflix, Stan, tenplay, ABC iview and iTunes give you access to everything that entertains you — from blockbuster movies, TV shows and live sports to breaking news and weather. There are also shows for kids, music events, live NASA feeds, podcasts and so much more. The fastest way to find what you’re looking for? Ask Siri. searches popular services — including iTunes, Stan and Netflix — to find exactly what you want. For example, ask Siri to “Show me some good dramas”. Or “Show me action films”. You’ll instantly see all your viewing options and whether you can rent, buy or watch with a subscription. There’s more to TV than just watching TV. Conquer alien planets right there on your couch. Use your rug as a yoga mat. Apple TV brings you completely new experiences made just for the lounge room. Apple Music in the house. Listen to songs from the vast Apple Music catalogue and your complete personal music collection on the best speakers in the house. Watch original shows, movies and content you won’t find anywhere else. Bring the world of music to your lounge room with Beats 1 radio. And DJ it all with just your voice and the Siri Remote. Put everyone you know on television. Easily view photos and videos from your iCloud Photo Library and shared albums on your Apple TV. The Memories feature in iOS 10 automatically finds recent photos and videos — even those you haven’t seen or thought about for a while — and creates beautiful collections you can show off on the big screen. It’s a great way to turn life’s best moments into the life of the party. AirPlay lets you share photos, presentations, websites and more. With AirPlay, you can wirelessly stream whatever’s on the screen of your iPad, iPhone, iPod touch or Mac to your TV. It’s an easy way for you or your guests to share photos, web pages and Keynote presentations in dramatic, big-screen fashion. 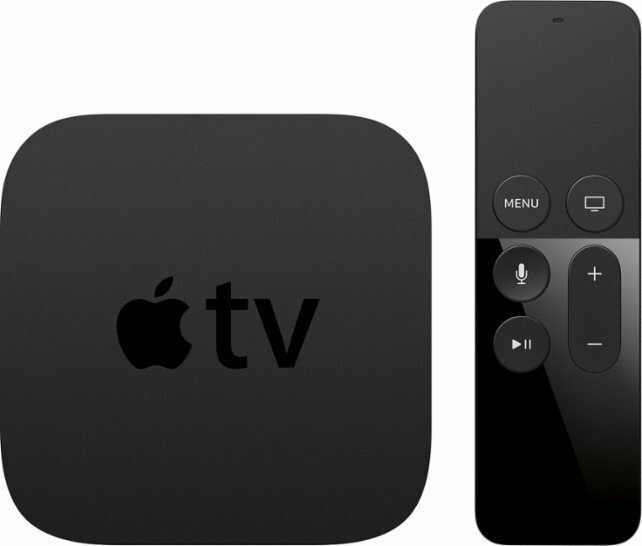 The Apple TV 64GB Media Streaming Device was added to the Media Streaming Devices category in June 2017. The lowest price GetPrice has found for the Apple TV 64GB Media Streaming Device in Australia is $265.00 from Landmark Computers. Other merchants who stock it are Landmark Computers, Video Pro.